Our 3rd annual Alameda World Baseball Bash will be held on Sunday, April 28 from 4-7 at the Aeolian Club. Funds from the Bash will offset player costs for their trip to Italy. For $50 each, guests will enjoy a catered dinner, music, no-host bar, raffles and auction. Support cultural exchange through the game of baseball at this benefit dinner hosted by Alameda World Tournament Baseball. 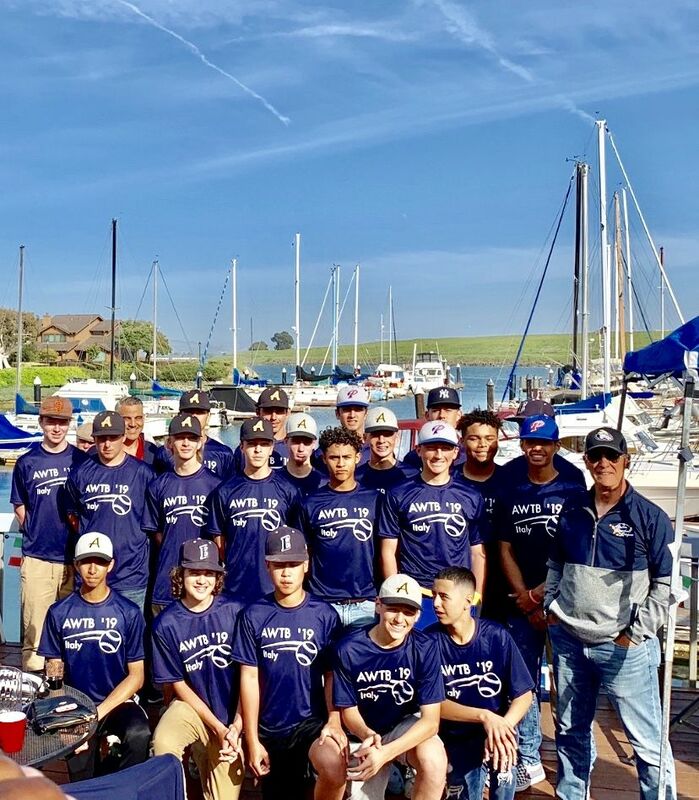 An Alameda team will join top players ages 14 and 15 from all around the world in Australia this summer for games and cultural activities. Funds from the Bash will offset player costs for a trip full of lifetime memories. For $50 each, guests will enjoy a catered dinner, music, no-host bar, raffles and auction. Prizes include First Class Weekend in SF, stocked wine cellars, private pool party and more. Sunday, April 22, 4-7 pm Aeolian Yacht Club, Alameda. The 2018 World Boy's Baseball Tournament will be held in Australia from August 4-8, 2018. AWTB, C/O Vali Ebert 1612 Cornell Dr, Alameda 94501. Please include your email address on your check. Super raffles/auction: Chance to win Hamilton tickets and dinner for 2 in SF - Oakland A's Private Suite for 18 - Pool Party and Barbecue for 20-30 - rolling chests filled with wine - multiple Giant’s tickets and more! Casual attire--We'd like to encourage guests to wear World Baseball shirts if you have them. If not, feel free to wear any baseball shirt you might have. *Donation in lieu of attendance may be made by check or electronically. Sunday, April 23, 4-7PM - Aeolian Yacht Club, 980 Fernside Blvd, Alameda - Dinner, No-Host Bar, Raffles, Etc. 2017 will have special meaning in Alameda because the best 14 and 15 year old baseball players from around the world will be coming in August to play in the 36th World Baseball Tournament. We will be hosting up to 8 international teams from Japan, Korea, Singapore, Italy, Germany, Australia and Mexico, in addition to 4 domestic teams. Join Alameda baseball greats including Ken and Kenny Arnerich, Jeff Croft and Carlos Macedo, Alameda’s World Team and many others from the community at this fun benefit. Mark your calendar! Please accept this letter as the official invitation to the 2014 World Boys Baseball Tournament. As you all know, this year San Diego, along with West Oahu Boys Baseball will host the tournament in Honolulu, Hawaii. The tournament dates are August 8-14. Opening Ceremonies on August 8 and championship game followed by closing ceremonies on August 14. These dates are tentative and subject to change. Teams who have already said they will participate are - West Oahu Baseball Red, Mexico Verde, Mexico Rojo, Australia, Italy, Japan, Korea, Guam, Singapore, Alameda, Fresno, West Oahu Baseball Blue and San Diego. ​Congratulations to these fine young men for their great contributions to the team this season. The Alameda Sun ran a nice article about the Alameda World Team in their Thursday, August 1st edition. The 2013 Australian World Team Roos visits Alameda for 5 Days. Australia and Alameda played a friendship doubleheader today at the College of Alameda with a BBQ between games. Alameda took both games with a score of 4 - 2 in the first and 10 - 4 in the second game. On Sunday both teams will go the Oakland Coliseum together to watch the A's game vs the Texas Rangers. The players and coaches have been invited by the A's to visit with the A's players before the game on the field! The Alameda World Tournament Baseball Board of Directors named the General Manager and Manager for the 2013 World Team Season and Tournament. 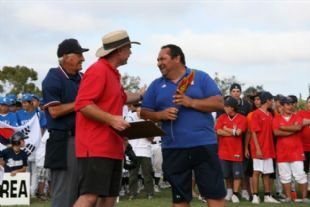 The World Tournament will be held in Fresno, California in August 2013. Buster Posey, of the San Francisco Giants, was in Alameda at the Little League fields on Tuesday doing a baseball clinic. 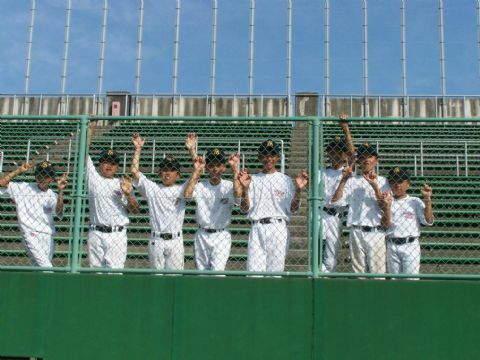 The visiting baseball team from Fukuoka, Japan was able to visit with Buster before their doubleheader with Alameda. The combined Fresno - Alameda team battled a team from Fukuoka, Japan on Sunday, July 22nd at the College of Alameda. The game went 7 innings and ended in a 7 - 7 tie. 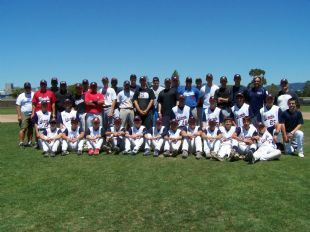 The Fresno - Alameda Team heads to Australia on Monday, July 30th for the 31st Annual Boys World Baseball Tournament. 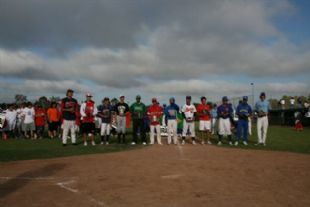 Alameda and Fresno have combined their teams to make one team for the 2012 World Tournament to be held in Australia. Three players from Alameda will be joining the Fresno team. Kenyon Ebert, Aaron Kees and Michael Woodworth will represent Alameda this year, but play on the Fresno team. 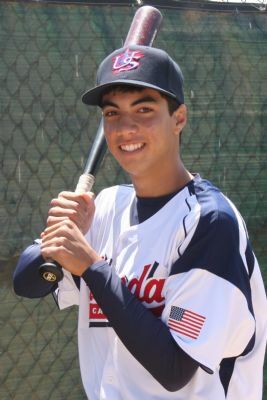 The Alameda World Tournament Baseball Board of Directors selected Joe Sherratt as the incoming President for 2012. The General Manager is Ron Matthews, the Manager is Carlos Macedo, and one of the coaches is Rich Krinks. 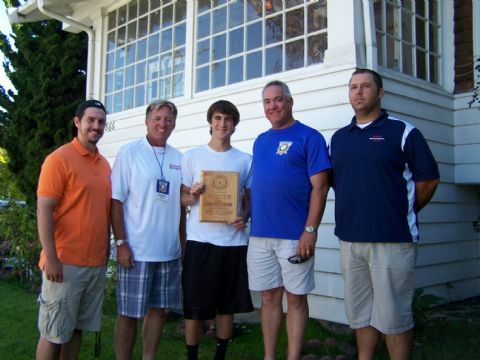 The Alameda World Team selected Sean Cunningham as this year's Katlyn Gillman Award winner. Katlyn Gillman was a Board Member for many years and had 3 sons go through the program. Katlyn lost a second fight with cancer a few years ago. 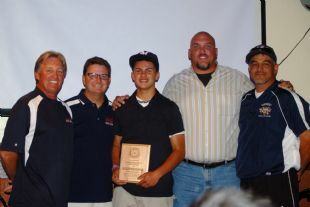 Sean Cunningham was awarded this inspirational award even though he was hurt and could not play. He attended all practices, cheered the team on and charted the pitchers for each game. Thanks for your dedication Sean and congratulations! 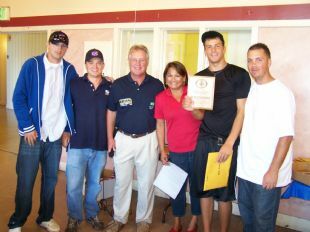 Erik VanWinkle is the 2011 Dontrelle Willis Award winner for the Alameda World Team. As a leadoff hitter, infielder, and pitcher, Erik was all class on the field and off and was a great leader. Dontrelle Willis, in his day, was a great player for the World Team and was a leader on and off the field too. Joyce Harris, Dontrelle's mom, was at the season ending party and presented the award to Erik. Congratulations to Erik for this very prestigious award! 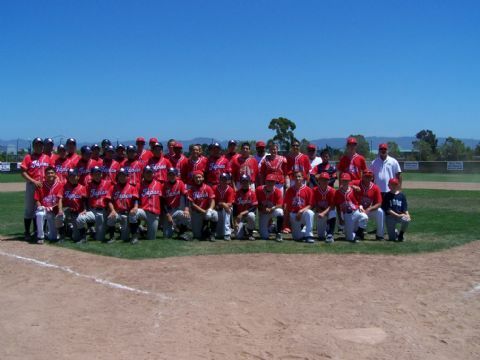 In the last game of the 30th Annual World Tournament the Alameda World Team lost to Korea 6 - 5. Alameda scored 5 runs in the first two innings to lead 5 - 2. But in the 6th inning Korea was able to score 4 runs to take the game. Unfortunately the game only went 6 innings due to the 2 hour time limit. Alameda ended the tournament with a 2 - 3 record and finished in 6th place. However, Alameda won 5 and lost 4 in Japan over the two weeks it was there. 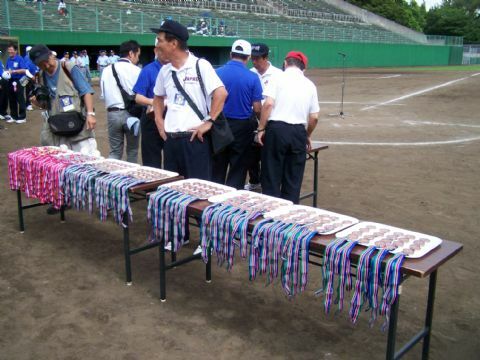 In the finals, the Japan National Team, beat Japan Kyushu in extra innings to bring the trophy back to Japan. Great day today as we pummeled Fresno 14 – 2. We were the home team and spotted Fresno 2 runs in the first, but then scored 14 straight to win in 4 innings. Kaleo Johnson was great on the mound and at the plate. Christian Leung smashed a 2 run homer and sent the game out of reach. After the game we all went to a Mizuno store and the boys had a great time picking out baseball gear. Tonight the team and everyone else went to a Pro Baseball Game courtesy of our host the Japan Boys Baseball League. It was a great time and unique experience. Tomorrow we play Korea for 5th place in the tournament. Then we have the closing ceremonies. 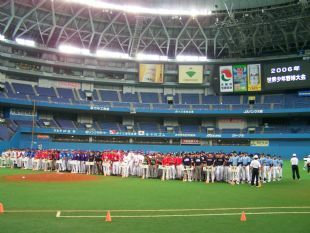 At the Leaders Meeting it was decided that the 2012 World Tournament will be held in Australia about 80 miles north of Sydney. 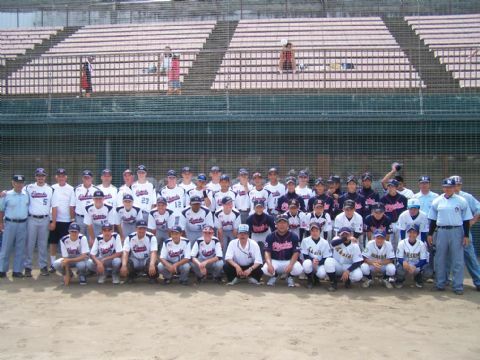 The Alameda World Team faced off with Japan’s National Team today and didn’t fare well losing 14 – 2. Japan took control of the game early scoring 2 in the first with 2 outs and then 8 in the second inning. Alamedahad lunch and got ready for their second game of the day against China. Alameda dominated China 7 – 0 with great pitching, defense and timely hitting. We ended up 3rd in our pool and will play Fresno at 9:00 am tomorrow. Tonight was the Welcome Party with every team, coaches and parents and travelers in attendance. There were a lot of speeches (including a nice speech in Japanese by our own Bill DalPorto), dinner and a Japanese drum exhibition. Bill DalPorto Throws Out the First Pitch! We participated in the Opening Ceremonies and Bill DalPorto was honored with throwing out the first pitch of the Tournament. We watched Japan crush China in 4 innings, had a lunch at the stadium provided by the Japan Boys Baseball League and then got ready for our game against Mexico Rojo. Alamedawas the home team and we held Rojo scoreless for a few innings and we kept threatening but couldn’t get the big hit. Rojo broke through for 4 runs in the fourth with hits all over the stadium and deep to the fences. Rojo had a solo home run in the 6 to make it 5 – 0. In the bottom of the 7th Alameda struck for 3 runs, but it was too little too late and we started the Tournament with a loss. On Tuesday we play a doubleheader against Japan and China. Everyone is in good spirits and we will play hard tomorrow. 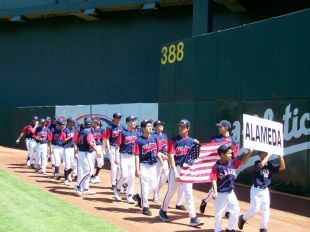 The Alameda World Baseball team won both ends of a double header today. The first team was made up of mostly all the home-stay players and we won 3 - 0. They had a very crafty curve ball pitcher and it took until the 6th inning before we scored. Mostly due to not having touched a baseball since last Sunday. The host families supplied the players and families with a wonderful bento box lunch between games. We were told that the 2nd team would be much more difficult to beat. We scored 3 in the first and never looked back winning 8 - 0. It was a warm day, but the boys held up well and are enjoying their home-stay experience. We will play another doubleheader tomorrow. The Alumni Game was an amazing mix of old and new talent with plenty of big hits, great pitching and dazzling fielding plays. The Alumni came from behind to win the game 11 - 10 in 7 innings. Everyone had a great time and the BBQ after the game was fun also. Thanks to everyone that put the day together. A special thanks to Bill DalPorto and Ron Matthews for donating their time as umpires. We hope to have even more players next year and do the golf tournament the day before the game. The Alameda World Tournament Team travelled 3 hours south to Fresno for a 3 game set against the Fresno World Team. Alameda easily took the first game of the doubleheader on Saturday, but lost the second game of the day. The players were sent off to their home-stay families and most everyone met up at one of the Fresno familie's beautiful home for a big party. Sunday, the Alameda World team got back on the winning track with a hitting barrage that caused the game to actually end in the 5th inning. The Fresno families put on a great BBQ after the game and the Alameda families and players headed home. A special thanks to the Alameda families that came down for the trip. We had close to 50 people in the stands for the weekend! We had a great weekend taking 2 of 3 from the visiting Fresno World Team. This was our first chance to see many of the players in action against competition since we have only had 2 practices. The boys played great and will only get better as we gel as a team. I want to take this opportunity to also thank the great support from the parents and families and friends of the players. We had a great turnout at Lincoln Park both days. Special thanks to the guys that helped do the fields along with the Plaisance’s in the scorer’s booth and Tom Tolbert. Very special thanks to Lorrie Tolbert for the great work on the 50/50 raffle on a moments notice. She helped us raise $270 for the team in about 30 minutes. The parents and families did a great job with the side dishes as we had a very special spread for the Fresno people. They were very impressed and some said that now the pressure was on them to do as good a job when we get to Fresno. Thanks to Tim Marr and Joe Sherratt and the entire Board of Directors for putting together the BBQ. The chicken was great and the trip tip wonderful. Thanks to Theresa Cooper for getting the tri tip donated! The Board really came through with more side dishes too. Thanks to Bill DalPorto, Mark Clement and Ron Matthews for donating their umpiring and time. We couldn’t have had 3 great games without your support. Thanks again to the Alameda World Team families that home-stayed the Fresno players. I heard all great things about the evening and I am sure that they will take good care of our boys in a few weeks in Fresno. The raffle winners are listed below. 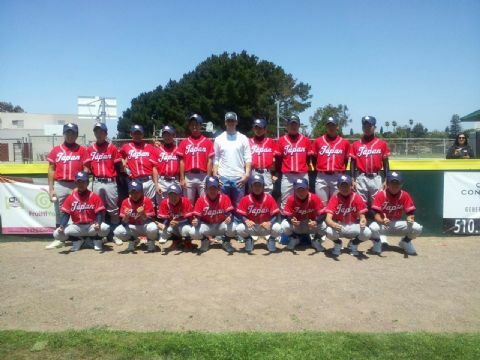 The Fresno World Baseball Team will travel to Alameda to play the Alameda World Baseball Team for a weekend series. Fresno will play two 7 inning games against Alameda on Saturday, July 9th starting at 11 am. Saturday night the Fresno players will be home-stayed by the Alameda World Team families. Sunday, July 10th the two world teams will play a 9 inning game starting at 10 am followed by a BBQ. All of the games will be played at Lincoln Park on Fernside Avenue in Alameda. Fresno will host Alameda for a similar weekend July 23 and 24. Joe Sherratt has announced that he needs to step down from the position of General Manager for the 2011 Alameda World Team. Joe regrets his decision, but he has some personal issues to take care of this summer. We wish Joe the best. The Board has selected Rich Krinks to replace Joe for the 2011 season. Rich has been a GM for the World Team 3 times and a coach 3 times including a trip to Japan where he was the head coach. Congratulations to all the returning and new players. There is a mandatory player/parent meeting on Sunday, December 12th at 7 pm at the Italian-American Hall located at 2712 Encinal Avenue, Alameda. Letters will be going out next week to all known Alameda 14 - 15 year old baseball players with an application enclosure. If you are interested please see the link above. During the latest Board Meeting the 2011 members of the Board were elected. After the election the officers where also elected to serve this year. Besides the Officers the other Board members have not been given assignments for the year yet. 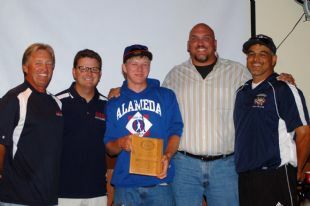 On Monday, August 16th the Alameda World Tournament Baseball Board of Directors held the 2010 Alameda World Team Reunion Party and also presented two special awards. The Manager, GM, and Coaches select the player for the 2010 team that made the most impact on the team. That player is awarded the Dontrelle Willis Award. Dontrelle played on the World Team previously and now plays in the SF Giants organization. This year's winner is Byron Buckley! The Katlyn Gillman Award (Katlyn is a former Board member that died too young) is given to the most inspirational player on the team and this year the award goes to Connor Finn! Congratulations to these deserving, young men. Andrew Pavao, catcher for the Alameda World Tournament Team was named to the Crystal Lake Tournament, All Tournament Team. The Alameda World Team families home-stayed the Fresno players over night on Saturday after the doubleheader. According to all the reports everyone had a great time! Sunday morning Alameda took on Fresno for a third time looking for a sweep of the series, but came up short losing 3 - 2. Anthony Olmo and Michael Perri pitched very well, but Fresno took the lead late. Alameda had the bases loaded with no outs in the bottom of the seventh poised to at least tie the game, but came away with no runs and a loss. After a great luncetime BBQ put on by the Board of Directors, the Alameda World Team took on the Australian World Team in a 7 inning game. Australia had been to Fresno for a few friendship games and came to the Bay Area to do some sightseeing and play the Alameda World Team. Adam Rees was great on the mound and at the plate. Alameda pulled ahead 5 - 3, but Australia got a run in the sixth to make it 5 - 4. With a one run lead Drew Huie was in to close the game and got the first out. The second batter reached on an error, but Huie picked him off first, however the ball was dropped at second on the tag. Eventually, that runner scored the tying run. A long fly for the apparent second out was hit to center, but the Alameda field lost it in the sun and the Austrailian on second scored to take the lead. Alameda threatened in the bottom of the 7th when Trevor Toy lead off with a single and stole second. However, he never made it home and Australia walked off with a win before they leave for Mexico and the World Tournament on Tuesday. Alameda came out strong and took two convincing wins over the Fresno World Team at the College of Alameda. Alameda won the first game 4 - 1 thanks to strong pitching from Geoff Ogata and timely hitting from Adam Rees and Andrew Pavao. The Alameda team took the second game 8 - 4 with almost everyone contributing. Dylan Holt pitched 5 stong innings and was relieved by Michael Perri for the last 2. Byron Buckley smashed one to the right centerfield wall for a triple and trotted home on the over-throw for a run. Alameda takes on Fresno for a third game on Sunday at 10 am at the College of Alameda. Australia will play Alameda later in the day at 1:30. 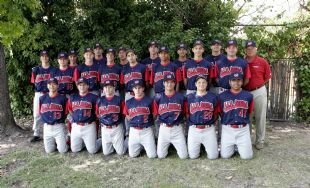 The Alameda World Baseball Team will play Fresno this weekend along with the World Team from Australia. All games are at the College of Alameda. Alameda played the Cougars from Kansas and lost their second consecutive game in double elimination play. The Cougars were able to score two runs in the first and one in the second to lead 3 - 0, but Alameda roared into a tie with 3 runs in the second. But the Cougars were up to the task scoring a runs in every inning of the game. Down 10 - 3 in the bottom of the 7th Alameda tried to stage another amazing comeback, but fell short as they could only score 4 runs and lost 10 - 7. Alameda is now out of the Gold Bracket. They will be returing home on Monday, August 2nd and then will play the Fresno World Team and the Australia World team over the weekend of August 7th and 8th. Alameda played Around the Horn, from Kalamazoo, Michigan in their first game of the double elimination portion of the tournament. Geoff Ogata was on the mound for Alameda and he gave up a run in the top of the first. ATH pitcher Sheppard was throwing very hard, but gave up a lead off double to Adam Rees. However, Alameda couldn't get him home. ATH struck for 2 runs in the 2nd, 2 in the 3rd and blew the game open in the 4th scoring 6 to lead 11 - 1 going into the 5th inning. Alameda finally got their bats going and scored an amazing 9 runs on 7 hits in the 5th to trail by one. The rightfielder for ATH was having a day having hit a home run his last time up and in the 6th hit a two run homer to put ATH up by 3. Those runs were crucial as Alameda scored two times in the bottom of the inning to trail by 1 again. Drew Huie struck out the side in the top of the 7th and Alameda was poised for a dramatic comeback. With one out Alameda had the tying run on second and the winning run on first, but didn't get the job done and lost a crazy game 13 - 12. The Alameda World Team was led by the pitching and hitting of Dylan Holt as they beat the Diamonds of Grand Rapids, Michigan. Alameda needed to win this game to advance to the Gold Round of the playoffs and the Diamonds needed to win. Many of the teams in this tournament are baseball academy teams and the Diamonds were a very well coached team. However, Holt mowed them down on the mound and Alameda hit the ball hard today. To help his cause Holt hit a laser shot over the leftfield fence for a 2 run homer and Alameda led 3 - 0 in the third inning. More timely hitting by Byron Buckley, Geoff Ogata, Andrew Pavao, Drew Huie, Michael Perri and Holt pushed the lead to 8 - 1. Reece Kamphuis made a nice running catch early in the game in left, Perri made numerous plays at second and Adam Rees made a highlight play at short in the 7th with the Diamonds threatening. Alameda won 8 - 2 and will learn it's seed and position tonight for the double elimination portion of the Tournament. The Alameda World Team lost a very close game to Brazil 4 - 2 on Sunday. Brazil's first pitcher was very good and tough to hit. Dylan Holt and Michael Perri pitched for the World Team. We hit 4 hard line drives in big situations, but they were right to Brazil's defense or the score would have been different. We play two teams from Illinois today. Beautiful weather without much humidity fortunately. The Alameda World Team beat the Crystal Lake Bombers 3 - 2 in their first game of the tournament. Geoff Ogata allowed 2 runs on 5 hits over 7 innings. Adam Rees lead off the bottom of the first inning with a long double to right center and Dylan Holt knocked him in with a single to right. However, the Bombers.struck for 2 runs in the 4th to take the lead. The World Team had runners on second and third in the 6th inning with one out and Christian Leung up. Christian smoked a line drive up the middle and scored Andrew Pavao and Conner Finn. Alameda was up 3 - 2 going to the top of the 7th. Ogata was up to the task and took care of business. Alameda now plays Brazil @ 2 pm today. Today was the Skills Contest. Christian Leung finished 4th out of 92 players in the Home Run Derby! We have both of our Around The Horn teams in the finals on Wednesday night! We finished 2nd and 3rd in the preliminaries. First game for us tomorrow at 2pm against a team from Michigan. Due to travel alert warnings issued by the State Department in regards to travel to Mexico the Alameda World Tournament Baseball Board of Directors have decided to withdraw from this year's Boy's World Baseball Tournament. However, they have accepted an invitation to play in a 48 team International Tournament in Crystal Lake, Illinois. 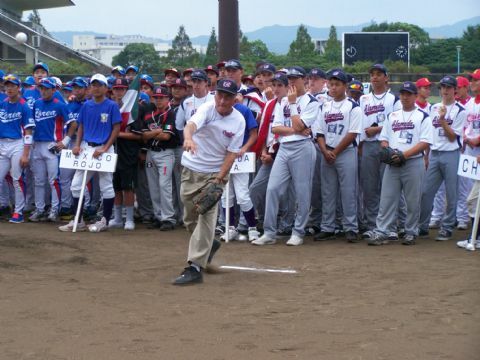 The international teams come from Puerto Rico, Brazil, Japan, Dominican Republic, New Zealand and Venezuela. Congratulations to those selected to lead the team to the World Tournament to be held in early August 2010 in Culiacan, Mexico. 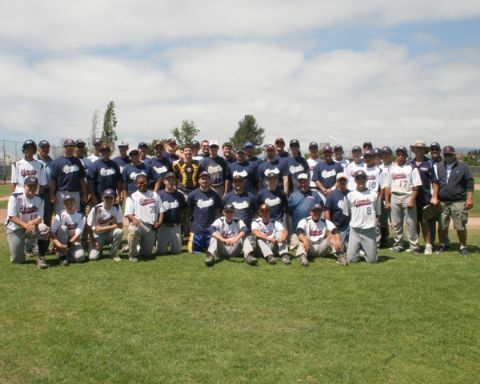 The 2009 Alumni Game was held on Sunday, July 26th at the College of Alameda. The Alumni showed no mercy as they beat the World Team soundly. Next year we will have to devise a fairer system as the Alumni pitching and hitting was no match for this year's World Team. Thanks to all the Alumni that came out and played. Here is a list of players and the year(s) they played. 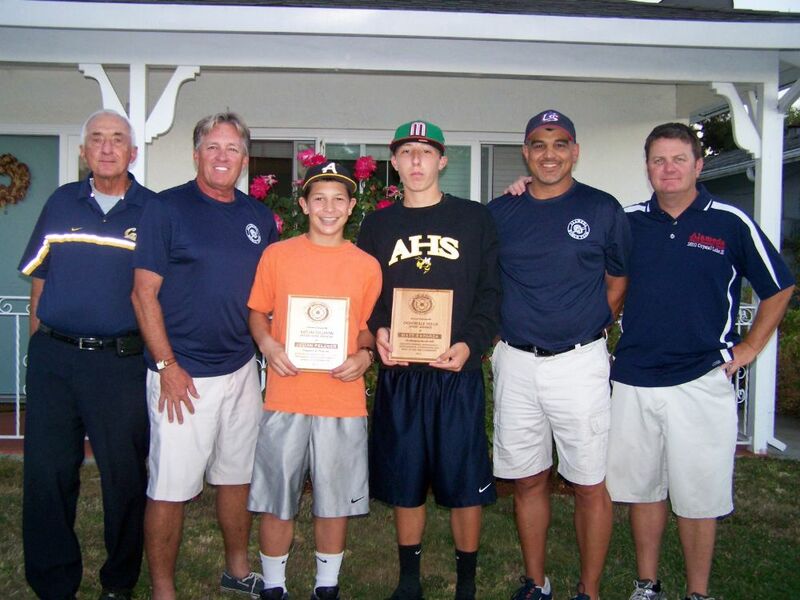 On Sunday, September 21st the Alameda World Tournament Baseball Board of Directors held the 2008 Alameda World Team Reunion BBQ and also presented two special awards. The Manager, GM, and Coaches select the player for the 2008 team that made the most impact on the team. That player is awarded the Dontrelle Willis Award. Dontrelle Willis played on the World Team previously and now plays for the Detroit Tigers. This year's winner is Daniel Skinner! The Katlyn Gillman Award (Katlyn is a former Board member that died too young) is given to the most inspirational player on the team and this year the award goes to Casey Jennings! Each team Manager, Coach and Leader chose a player from their own team that showed the best sportsmanship during the tournament. These players aren't necessarily MVP's, but great sports and very important to the comaraderie of the team. Congratulations to all winners! Alameda played Mexico Verde into extra innings and fell in the bottom of the ninth. They played very well in the tournament and ended in 4th Place. 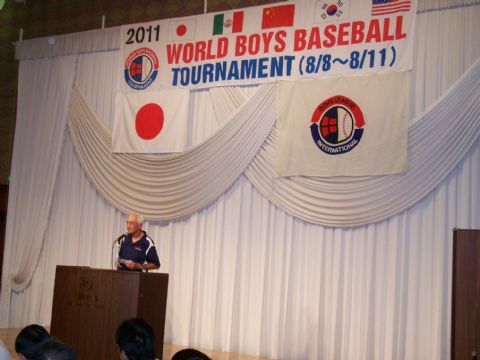 On Thursday evening, 8/14/08, at the Leader's Meeting, the World Boy's Baseball Tournament sites were voted on for the years 2009 and 2010. Nettuno, Italy will be the site in 2009, hosted by Alfonso Gualtieri. Nettuno is considered the the baseball capital of Italy. It is located 30 miles South of Rome. Mazatlan, Mexico will be the site of the tournament in 2010 hosted by Mexico Verde.